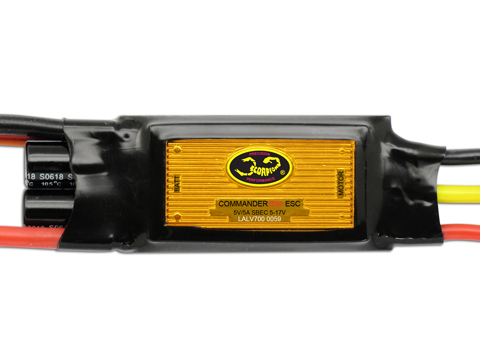 The Commander 4S LBEC series ESC(V3) operates from 6 to 17V. It features switching BEC will convert the voltage from your battery packs to 5V to power your receiver and servos. The Commander LBEC will deliver 3 Amps of continuous current with 5 Amps bursts. And can handle up to 4 digital servos or 5 standard servos on fix wing models. With a Switching type BEC, the BEC is not needed to de-rate as the input voltage increases. The full 3 Amps of BEC current is available for input between 2-cell to 4-cell Lipo operation.